Hello everyone! I have to warn you that this is probably the easiest card I have EVER made! I wasn't going to write a blog post but then I got to thinking that not everyone has the supplies that some of us have and that maybe after they see how easy this card was to make, someone might look at their supplies in a different light. Does that make sense? OK...so back story here...I love dessert - cake, cookies, chocolate and ice cream. And I always make a joke about having dessert first, before dinner. I tell people that if I eat dessert first and then die, at least I will have died happy. I know...LOL but kinda creepy. So the other day I was putting together a box of crafty stuff to donate when I came across a package of "Sassy Sayings" stickers by Momenta. When I saw the sticker I used on this card, I just had to make this card. 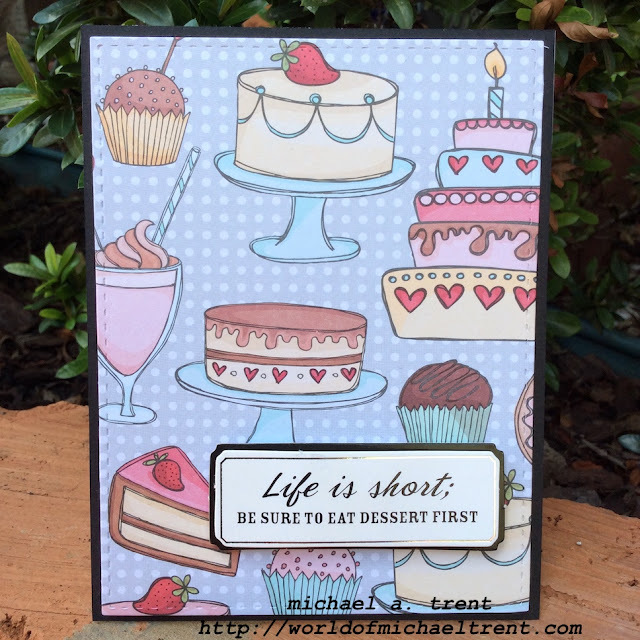 Using a stitched rectangle die I cut a piece of DSP that had desserts all over it (a Brasilian brand). I adhered this to a piece of fun foam, which I then adhered to my card front of black cardstock. Then I adhered the sticker. Done! 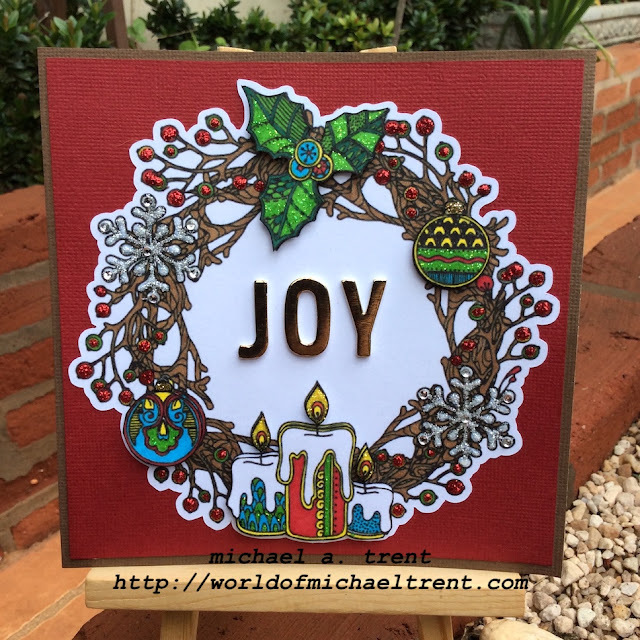 I did find some time to make a super simple Christmas/Holiday card using another beautiful image from Anthony's Paper Craft. Honestly, I made this card in under 10 minutes (not counting the time the Stickles needed to dry). 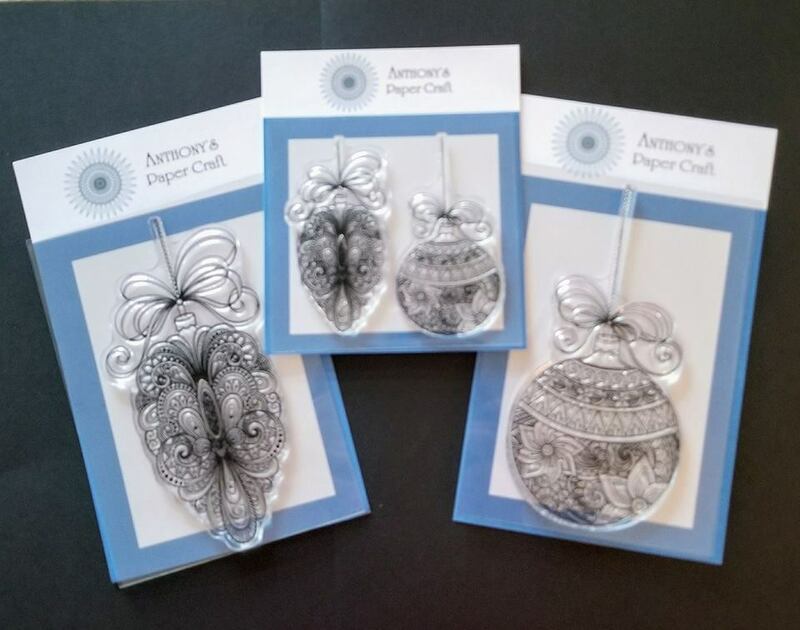 But...before I get to the card I wanted to let you know that Anthony's Paper Craft is having a 20% off SALE until Dec. 31st. 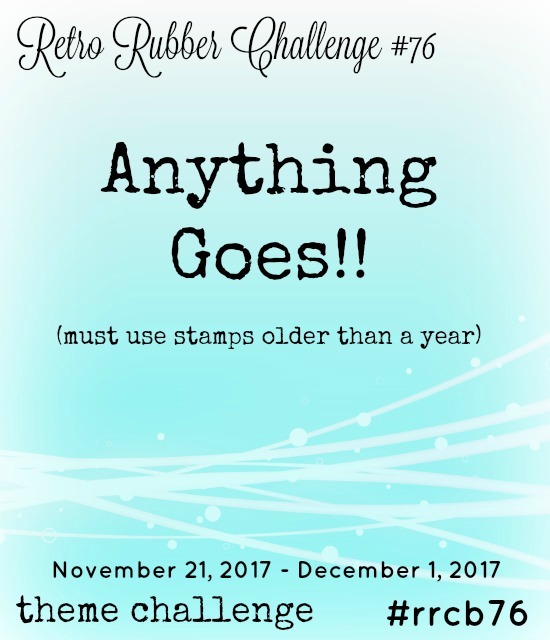 So, if have loved my projects using their stamps, now is a great time to grab some. No coupon needed. Just add what you want to the cart and the sale price will be reflected! I started by cutting a piece of white cardstock with the largest die from Rectangle die set (Cottage Cutz). 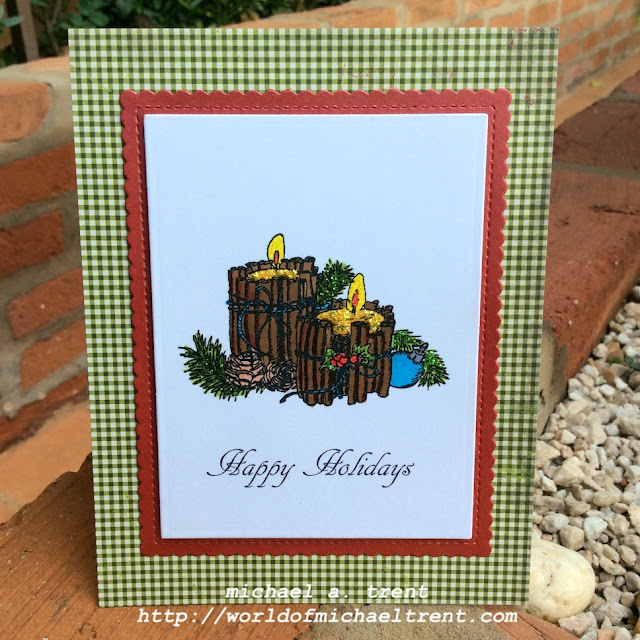 Then I stamped the Candles & Pine image and the "Happy Holidays" sentiment from the Christmas Sentiments 1 set, using Tuxedo Black Memento ink and my Misti. I then colored in the image with various fine tip Bic Markers. I made a top folding A2 card base of white cardstock, to which I adhered a piece of Christmas paper. I then used the largest die from the Nested Stitched Scallop Rectangle set (Cottage Cutz) to cut a piece of metallic red cardstock and a piece of white fun foam 3" x 4". Now it's just putting the layers together. Adhere the fun foam to the back of your colored image cardstock. Then adhered that to the red cardstock. Then adhere the red cardstock to the card front. To give a bit of shimmer I adhered some Firefly Stickles to the holly leaves and fir branches and some Yellow Stickles to the candles. Hello...Hello...Hello...everyone!! Today is a special post for me. I was invited by my friend Debra (Meticulosity), and her friend Celeste (Crafting Junky), to join them for some cyber coffee and to talk about "love" or, more specifically, what we "love". 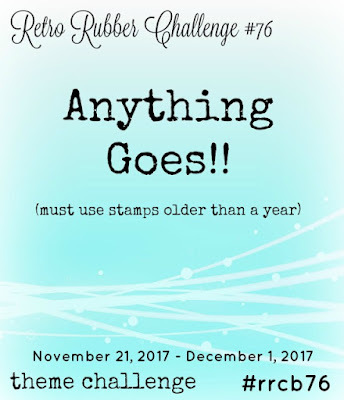 Let's call this a "mini blog hop". First off...the coffee I am drinking this beautiful morning is a cup (or 3) of Extra Strong Coffee by Melitta. It's a brasilian coffee that is just super tasty. Not bitter with just a hint of a chocolate taste (at least to me). Yes, I save the box to use as a mini album cover! OK...back story. I met Debra in a Facebook group. We both have a lot in common - making cards, coffee, donuts, zombies! I know....crazy! 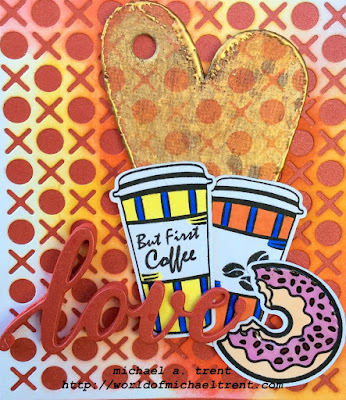 Deb asked me to pick the subject for this mini blog hop and I chose the word "love". 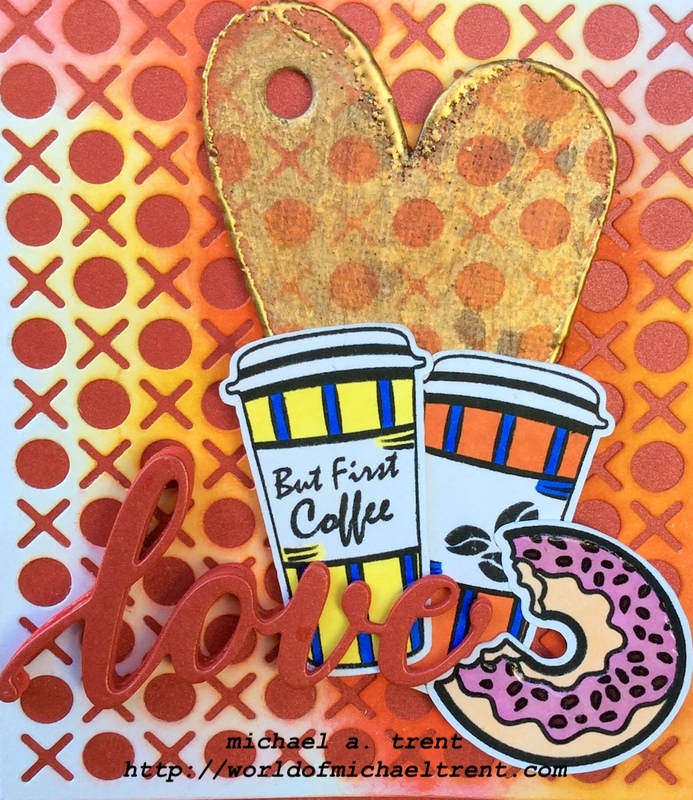 Love means many things to different people so I tried to make a card that included traditional love, with the XOs and the word love, as well as some other things I love - like the coffee and the donut. 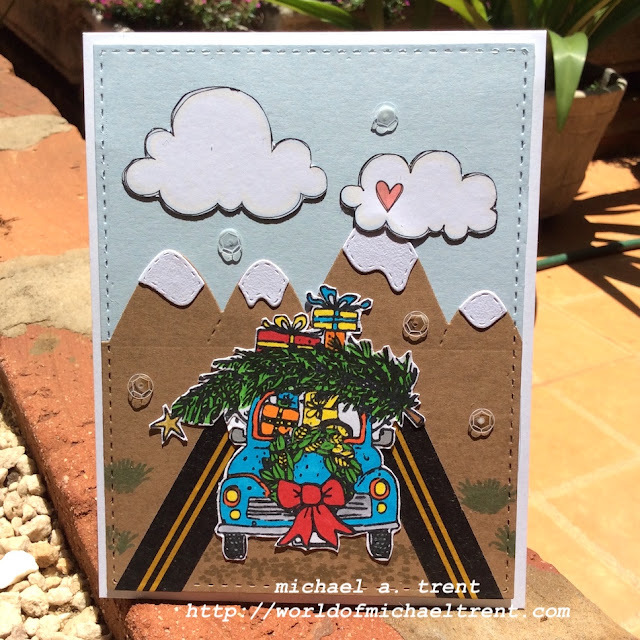 I had a boatload of fun making this card and step by step and hope you "love" it too. I started with a white chipboard tag heart (retired/Bazzill) I found in my stash, that I covered with gesso. Next I sprayed some of the Gilded and Pressed Petal Color Bloom Spray Mists (Prima) on the heart until I got the look I wanted. I also applied Candied Apple Distress Ink around the edges of the heart. 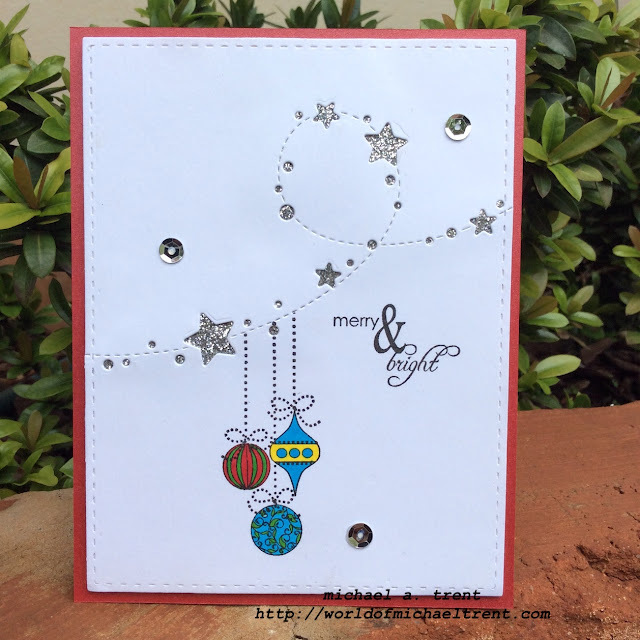 Next, I die cut a piece of white cardstock with the Hugs & Kisses Coverup die (MFT Stamps/retired) to make a stencil. 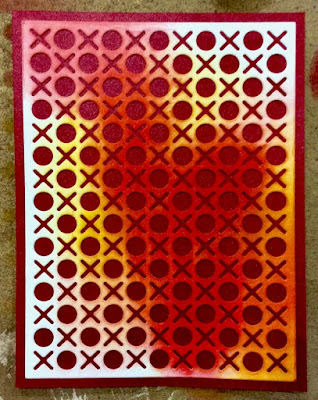 I then placed the stencil over the heart and applied candied apple and mustard seed distress inks to achieve the design. I also applied the candied apple around the edges of the heart. Because I never know when to stop....I grabbed my Versamarker pen, heat tool, and aged gold embossing enamel (Stampendous) and embossed the edges of the heart. Gold...red....works with "love". Right? I made my card base with white cardstock and then adhered a piece of red metallic cardstock to the front. 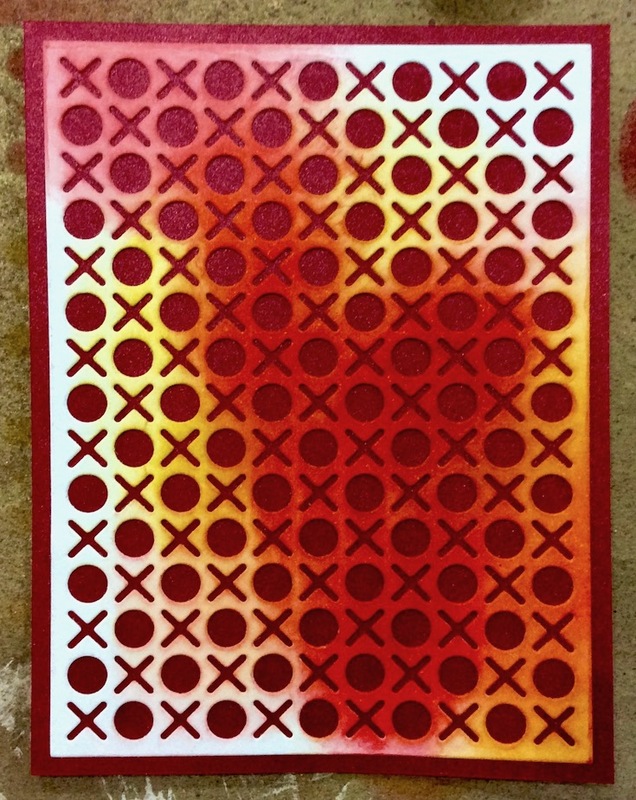 I was liking how the XO stencil looked so I applied some more of the inks and then I adhered it on top of the red cardstock. Now for the fun stuff. 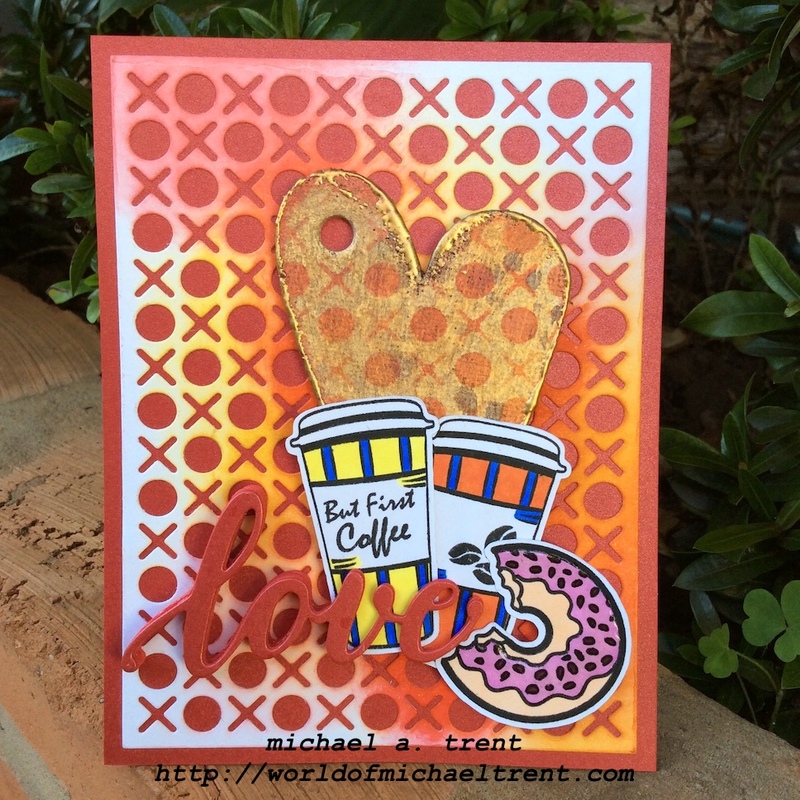 I stamped, die cut, and colored - two coffee cups from the Coffee Cup set and die cut them with the matching Coffee Cup die set (Prickley Pear), and the donut from the Donut Worry....Be Happy set and die cut it with the matching Donut Worry Coordinating die (Brutus Monroe). I also die cut the Little Luxe die (Poppy Stamps) - once out of the red metallic cardstock and a few times out of red fun foam. After I colored in the donut I applied some glossy accents over the pink so it would shine like frosting and allowed it to dry. Then I adhered the red metallic word to the fun foam layers and adhered that over the coffee cups. Done! Here's a close up of all the pieces on the card. This is not really a typical card for me but it was fun to use products I don't usually think about and it was fun to think a bit out of the box. I would love to know what you think of this card so feel free to leave me a comment below! Today I have a super simple, but beautiful, Christmas card for you. Not many photos for the actual step by step because it's really that simple. I made this card in under 10 minutes! I started with a top folding A2 card base of white cardstock. I went through my stash and adhered a piece of cardstock to the front of the card. 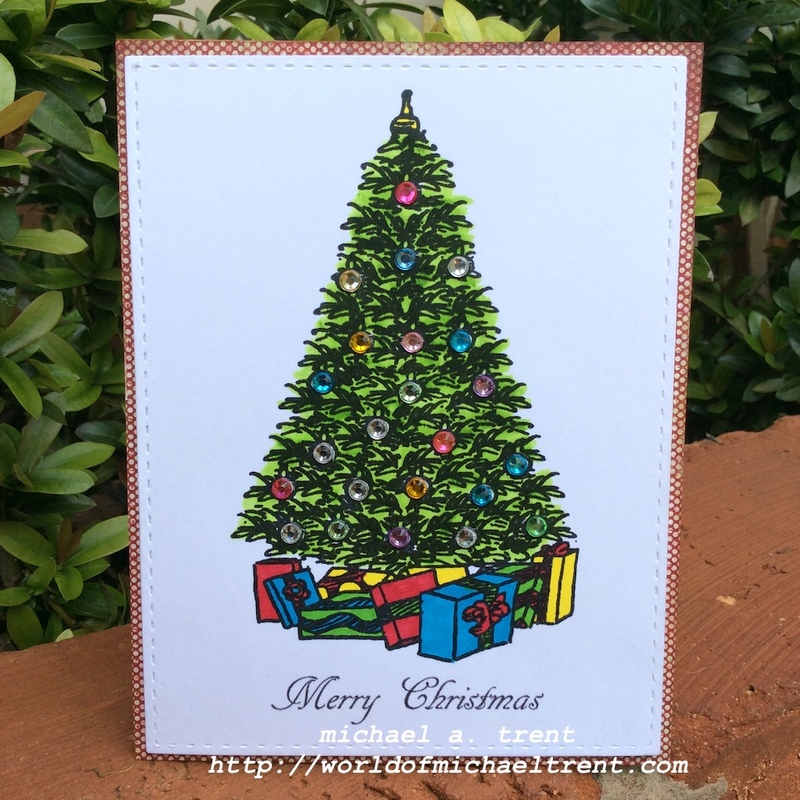 I used a stitched rectangle die to cut a piece of white cardstock on which I stamped the tree from Christmas Set 2 and the phrase "Merry Christmas" from Christmas Sentiments 1 - both from Anthony's Paper Craft. Then I grabbed red, green, yellow and blue Sharpie markers, some colored crystals, and my Tombow Willow Green (No. 173) marker for the tree. Now to color. 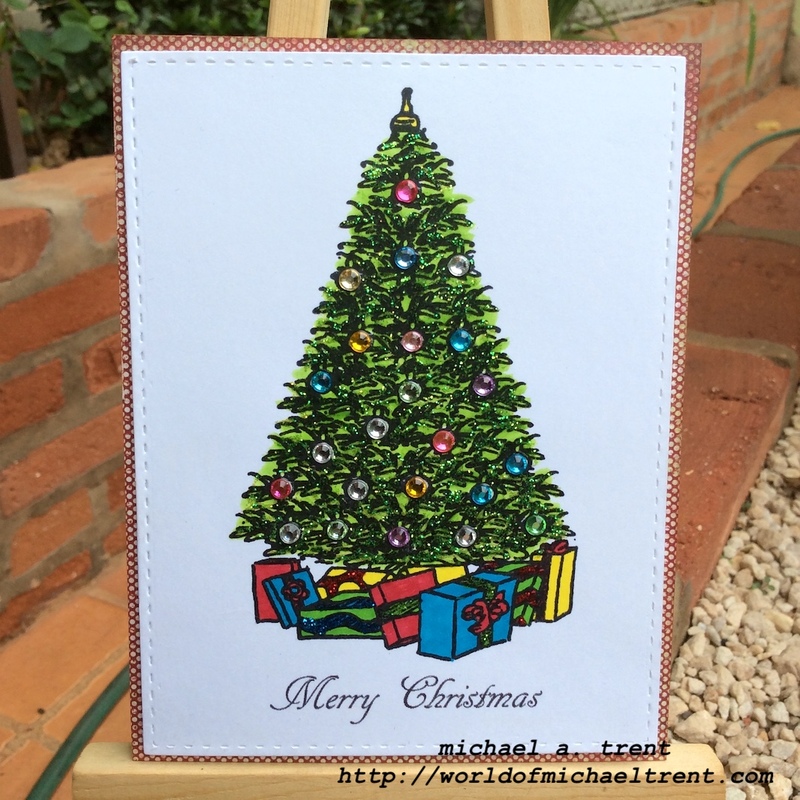 I went over the whole tree using the Tombow Willow Green marker. The way this image is drawn you really can't go wrong when coloring. Just brush the marker over the whole tree. Then I colored in the presents using red, green, blue, and yellow Sharpie Fine Tip markers. I cut a piece of white fun foam, which I adhered to the back of the image cardstock, then adhered this to the card front. After that, I adhered some colored crystals for the ornaments and then some True Blue, Christmas Red and Firefly stickles on the presents and Firefly on the tree form some shimmer.